Last month a row broke out between two promoters in Glasgow City Centre over the club nights’ shared name, Milk. MILK Glasgow is a monthly indie night which has been running for over four years at the venue Flat 0/1. It was founded by two graduates, Hannah Currie and Aileen Lynn, in order to showcase new bands in the city. Their branding was created from a successful 2011 poster by Aileen’s brother, Craig Lynn. Milk Fridays was launched as Milk Tuesdays in Edinburgh last August by events manager Hamish Rowe. However, Kushion, which neighbours Flat 0/1 on Bath Street, now also hosts the weekly club night. Rowe claims he did not realise there was an event of the same name in Glasgow. 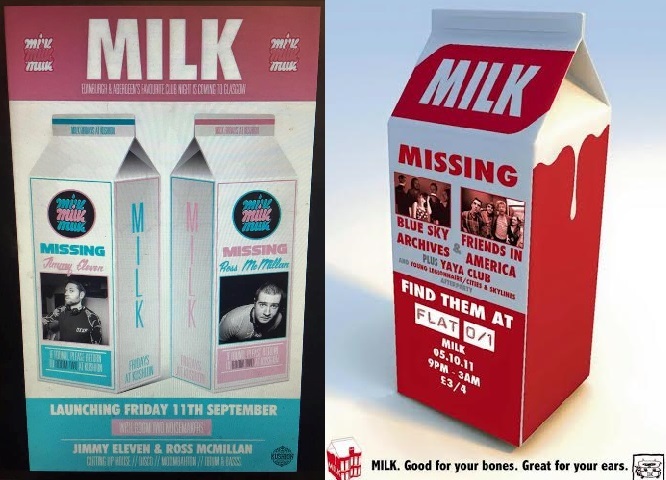 MILK founders Currie and Lynn accuse Milk Fridays of not only copying their name but also their branding after the new club night released a poster which featured the same the same milk carton logo and even the same font as their 2011 poster. Rowe said a DJ who works at their events created their milk carton poster and it had nothing to do with MILK. The new club night also changed the name of their event on Facebook from Milk Glasgow to Milk Fridays to try and prevent confusion. The new club night, Milk Fridays, has also been accused of overtly sexualised and provocative adverts which feature bottles of milk being poured over skimpily clothed models and over (mostly women’s) faces.